The saying, “Opou geis, kai patris,” is a familiar one attesting to the Greek spirit of seeking out fortune and adapting to many foreign soils. But as evidenced by the Greek community of Madaba, Jordan, not only can Greeks simply exist in foreign lands, they usually prosper. At the heart of this community is the Orthodox Church of St. George. The church broke ground in 1884, when the Greek Orthodox community saved enough funds to start construction. But to the surprise of the builders, under it were the remains of a Byzantine dating back to the 3rd century. It was on the floor of this ancient Greek church that the earliest, most extant map of Palestine was found; it literally put the map on the map. 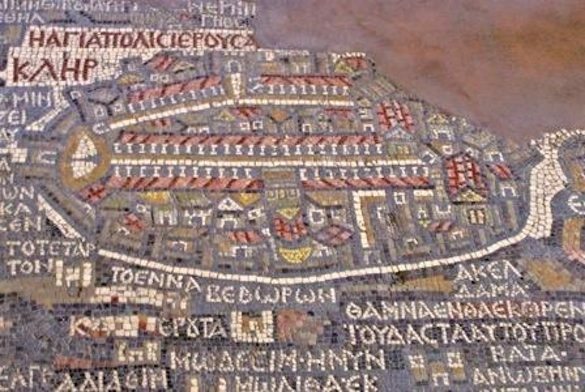 With 157 captions (in Greek) depicting all the major biblical sites of the Middle East, the mosaic constructed in AD 560, was originally around 25m long (some experts claim 15m is more accurate) and 6m wide. It once contained more than two million pieces but only one-third of the original mosaic has survived. Next to the church and second in importance to the community is the Greek Orthodox School of St. George. Headed by Father Innokentios, a resident of Jordan for close to 50 years, the school provides a high quality education to both Christian and Muslim students alike. It is ranked among the top ten private school establishments in Jordan and currently has a waiting list of 540 students, of which only one-third have room to be admitted. The school is part of a larger network of schools under the Greek Orthodox Patriarchate which boast 6,000 students in 13 schools, with 800 teaching staff. “This is the oldest Christian educational establishment in this land, dating back from the early days of the Ottoman Empire,” says Father Innokentios. The Orthodox community, he states, dates back to the early Christian period in this land and was never imported. The Patriarchate ran the only language school to learn Greek in Amman. However, after the collapse of the Greek economy two years ago with the onset of the crisis, most of the Greek teachers imported from the mainland were retracted leaving the facility to struggle. Independent efforts to sustain the teaching of Greek are currently being made by the Orthodox community to keep its doors open, yet it remains hard to keep the language and culture alive without any native teachers of Greek. However, St George Greek Orthodox School does provide after-school Greek lessons as it does advanced ESOL certificates in conjunction with its partnership with the British Council. There are approximately 500 Greeks in greater Jordan, according to the latest figures by the Ministry of Foreign Affairs, and close to 150 families comprising of both Greek partners. Most have settled in the area either by way of intercultural marriage or business. 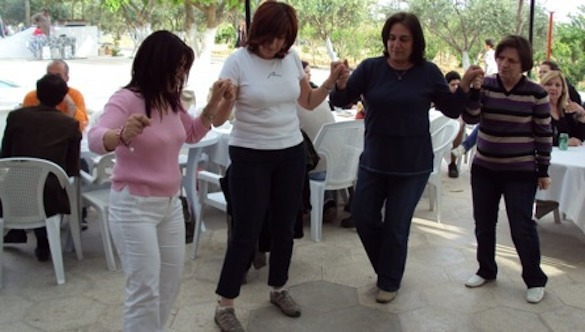 The main Greek association is the “Association of Greek Women of Jordan,” which is active socially and culturally and organizes film screenings, talks, and events about Greece as well as celebrates traditional holidays Greek-style. A Parent-Teacher Association has been set up to support the Greek community school and promote the teaching of Greek language and culture to young Greeks, who are active through the “Association of Greek Youth of Jordan”. The Greek Orthodox faithful in Jordan are estimated at some 120,000, most of whom are Arabic speaking. There are currently 29 Greek Orthodox churches – with that number on the increase – which come under the Jerusalem Patriarchate. St George Orthodox School is always in need of volunteers to teach English or Greek. Teaching a year in Jordan would be ideal for a retired couple or a young person on his/her gap year. The job comes with attractive living accommodations, medical insurance, Arabic lessons, and spending cash. For further details, contact Father Innokentios at diodoros@orange.jo. Maybe you can help me to get an email address of a Greek Orthodox church at the Baptism site on the Jordan river as we wish to baptize a baby there this year.